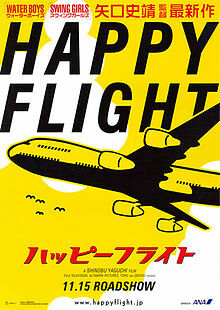 The film Happy Flight is about Kazuhiro Suzuki, a copilot who is trying to qualify as a pilot, and Etsuko SaitÅ, a young flight attendant going on her first international flight, who service an All Nippon Airways 747-400 as Flight 1980 to Honolulu, Hawaii, United States. Suzuki feels stressed when Captain Noriyoshi Harada becomes his evaluator, while SaitÅ becomes stressed when she learns she is working under Chief Purser Reiko Yamazaki. The story also tells the story of Natsumi Kimura, a ground staffer who deals with issues regarding the flight. The plot revolves around the logistics of preparing Flight 1980 for a timely departure. The aircraft serving has been reported with malfunctioning heated pitot tubes, but the captain decides to postpone the repair to avoid delays, relying on redundant instruments available. Bird patrol has been dispatched to fend off pigeons. Immediately after takeoff, an instrument alarm prompts the captain in command to switch to the backup pitot tube as their primary indication. The captain mistakenly transmits the cabin announcement to the air traffic channel.